Manufacturer and trader of matt paver block-triangle, chequered tile etc. A heavy duty combination for heavy duty applications. rupam chequered tiles are the ideal solution to external in heavy traffic areas- offering you anti-slip flooring that gives a better grip and does not wear out easily. rupam chequered tiles have exceptional strength to withstand the toughest daily grind and the heaviest wear and tear. Manufactured under hydraulic pressure, they are more wear-resistant than ordinary chequered tiles. An ideal choice for packing lots, driveways, pathways, swimming pools decks, building compounds, petrol pumps, warehouses and heavy traffic areas. Rupam chequered tiles are available in a range of patterns and sizes to suit both regular and heavy-duty applications. Paver Blocks used for external floors are in great demand in modern building owing to their beauty, durability and economy. 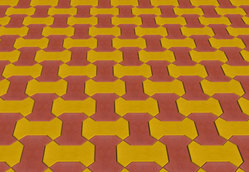 Paving blocks floors can be made in any design or shape desired. Its most popular because of the unlimited variety of pleasing patterns and colored schemes. Paving blocks are increasingly used not only in walks ways and jogging tracks but also in entire building compounds, storage yards, petrol stations, swimming pool decks, parking lots and other landscaping areas. Highly wear resistant in nature, the life of the blocks is much more than the ordinary P.C.C. done in the external areas. Compressive strength of 400 kgs / cm2. Pavers can be made as per customer specifications. We have supplied pavers with compressive strengths in excess of 550 kg / cm2. Water absorption less than 10% and abrasion resistance under 2 mm can be made available. 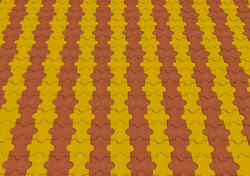 Pavers are generally available in thickness of 60 mm, 80 mm, 100 mm. Other thickness may be possible on request. There are two types of Paver Blocks.